By 3:30 P.M., however, the entire Federal line from here to McPherson's Ridge had begun to crumble and Paul's regiments were ordered to retreat to the Seminary where other troops of the 1st Corps were making a final stand. To give the brigade time to get away, the 16th Maine Infantry remained on Oak Ridge, holding off the Confederates until they were trapped and forced to surrender. The men gave up their weapons only after they had taken down and destroyed the regimental flag so that it would not be captured. To prevent the humiliation of surrendering his sword to the Confederates, Colonel Charles W. Tilden, the 16th's defiant commander, drove his sword into the earth and snapped it in two, leaving only the guard and grip for a southern trophy. The sacrifice of the 16th Maine gave the rest of the brigade valuable minutes to make their way down Oak Ridge to a point where the railroad bed cut through the ridge. The men followed the embankment toward Gettysburg with other troops and ran a gauntlet of Confederate fire before dashing into the borough streets. 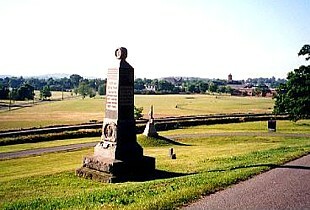 Placed in the fields east of Oak Ridge were two under strength divisions of the Eleventh Corps. General Carl Schurz, placed in temporary command of the corps, deployed his regiments in the fields around the "Alms House", which was the county home for the poor. Fighting began when Georgians of General George Doles' Brigade moved down the Carlisle Road and engaged the Union troops on the county farmland while southern batteries sent shells into the Union positions. Union artillery replied and drove some of the Confederate batteries to cover. The front appeared to be stable when suddenly, Confederate artillery boomed from the east and shells whirred into the exposed Union right flank. 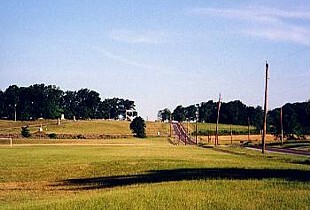 General Jubal Early's Division had arrived from the direction of York and immediately attacked the open Union flank anchored on a small hill, today called "Barlow's Knoll". Schurz's corps collapsed and the town was soon full of retreating Union troops, pursued by victorious Confederates. From the Oak Ridge observation tower, visitors can get a great view of the entire first day's battlefield, Gettysburg College and the town. 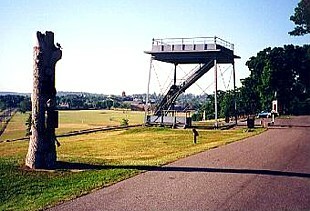 The tower is located near the point where the two Union corps (the First and Eleventh) connected. This is one of three surviving War Department-era towers, constructed at the turn of the century. This particular tower was modified in the 1960's due to a structural failure in the upper section. There are also some interesting and unique monuments placed here by veterans of the battle that help tell the story of the action here on that warm July 1st. One in particular is that which commemorates the services of the 90th Pennsylvania Infantry, sculpted in the shape of a large oak tree. Veterans of the 90th recalled the large stump of the tree that stood near this spot during the battle, and voted to place its likeness in granite, adorned with the bronze accoutrements of war, to mark the site where the regiment fought that day. One of the most symbolic monuments on Oak Ridge is that to the 11th Pennsylvania Infantry, upon which stands the full-size bronze likeness of a Union soldier overlooking the fields where Iverson's North Carolinians made their fateful charge. This monument has a unique addition at its base; a bronze statuette of a small, mixed breed dog named "Sallie", a stray that one day wandered into the camp of the 11th Pennsylvania and became attached to one of the regiment's soldiers. Her appearance in the ranks while on dress parade or during the march was a curious site to many, though it was not uncommon for soldiers to informally "adopt" a pet of some sort, and the men in the rank and file evidently enjoyed Sallie's companionship. Sallie made the long trek from Virginia to Pennsylvania in the summer of 1863 and went into the fighting on July 1st alongside her human comrade. When the Union line collapsed that afternoon, survivors of the 11th Pennsylvania staggered through Gettysburg to Cemetery Hill, where they reformed and counted their losses. Among the missing was the small dog, lost in the confusion of battle or during the retreat. Late on July 5th, a burial detail from the regiment made their way back to the scene where the regiment fought on Oak Ridge. Here they discovered Sallie lying among the corpses of the regiment which had adopted her. Very much alive and loyal to a fault, she had remained with her fallen master. Sallie was taken by the detail back to the regiment and informally adopted by the men as the regiment's mascot. Sallie remained with her regiment, sharing in the dangers and duties that her masters faced until she was killed at the Battle of Hatcher's Run, Virginia, in 1864. 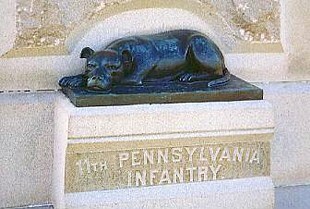 When the veterans of the 11th Pennsylvania Infantry erected their monument at Gettysburg in 1890, they chose to add the likeness of the homely little dog that brought happiness to their lives as soldiers, for she was the most humble symbol of loyalty they had experienced during the war. Recommended Reading: Damn Dutch: Pennsylvania Germans at Gettysburg, by David L. Valuska (Author), Christian B. Keller (Author), Don Yoder (Foreword), Scott Hartwig (Contributor), Martin Oefele (Contributor) (Hardcover). Review: This is the first work to highlight the contributions of regiments of the Pennsylvania Dutch and the post 1820 immigrant Germans at the Battle of Gettysburg. On the first day, the 1st Corps, in which many of the Pennsylvania Dutch regiments served, and the half-German 11th Corps, which was composed of five regiments of either variety, bought, with their blood, enough time for the federals to adequately prepare the high ground, which proved critical in the end for the Union victory. On the second day, they participated in beating back Confederate attacks that threatened to crack the Union defenses on Cemetery Hill and in other strategic locations.